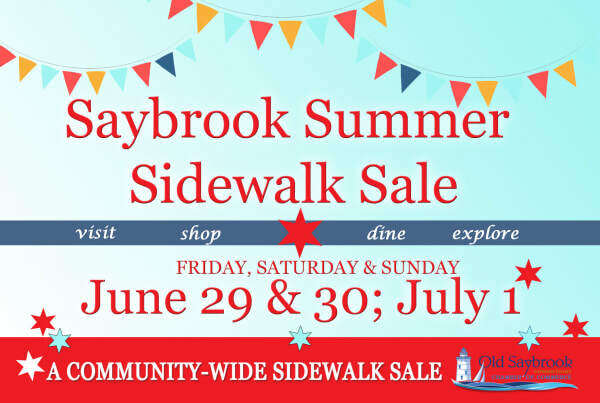 Visit Old Saybrook and area businesses during this 3-day period for fantastic sales and promotions. Watch this space as our list of participants grows! Business Owners: we invite you to participate! Take advantage of this promotional opportunity. Your business name will appear on flyers, on the Sidewalk Sale shopping map, on social media posts and elsewhere! You decide what specials you'd like to offer. Free for Chamber members, $25 non-members. Check back often as we update this page! Beach Club Fitness - Summer Slimdown Personal Training Special: $75 per session; Summer Membership Special: 3 months for $99. Bongo Ron's Cigar & Lounge - Friday: 20% off select premium cigars, 10% off event bookings. Saturday: 2-5pm event w/ 30 Mile Brewing, with a 3 cigar purchase receive 3 free tastings of local craft brews, 21 and over. Live music by T-Ray! Sunday: Buy 3 get 1 of our 4th of July special cigar--the Brickhouse Dbl. Connecticut flag wrap! Chalk Mercantile - Buy 1 liter of Autentico Vintage paint get a 100ml sample pot of Autentico Vintage free. Buy 1 quart of Miss Mustard Seed's Milk Paint get 1 sample size of Miss Mustard Seed's Milk Paint free. Colin’s Tux Shop - Up to 50% off fine men’s clothing. Fri & Sat only. Dagmar's Desserts - 20% off all breakfast pastries including scones, croissants and danishes. Enter to win a $30 gift card. Design Essence - Everthing on sale. Up to 50% off select items! Old Lyme Seafood - Friday only Free 7oz. Cocktail Sauce with purchase of 2 lbs. or more cooked shrimp. Saturday only 10% off ALL Raw Shrimp. Sunday only $5 off purchase of $35 or more. Excludes cooked shrimp. Sweet Luna's - Cool off with $2 specials: 16oz Ashlawn Farm Cold Brew Coffee, Del's Lemonade, Frozen Slushies. The Bowerbird - Outside tent sale with items up to 70% off; deals on select items inside the store up to 30% off.